This agreement covers an arrangement whereby you have some complete unit or most of the parts and you want some other firm, maybe abroad, to add other parts, mark, pack, and make up ready for the market. It is suitable for any industry from clothing to an industrial gizmo. Specification of work to be attached by you or entered in schedule. Manufacturer may be home or abroad. Professionally drawn and very thorough. 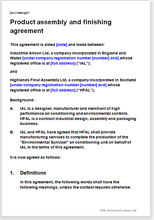 This agreement for manufacture from your parts or materials has been drawn to cover the structure of a complicated deal in simple terms you can edit yourself. The essence is that you can produce a product but need someone else to add supplementary parts, before it is ready to sell. That other firm will then test, label and pack, before return to you. Maybe you have had your product made abroad and need final stages at home to qualify as “Made in New Zealand”. Your product could be any, from a fashion item to an industrial pump to a food product. We leave it to you to provide your specification for design, finished product and standards to be achieved along the way.